Download Higher Secondary (H.S.) 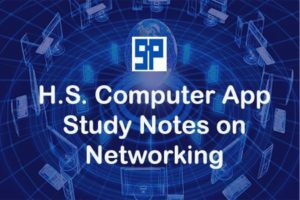 Modern Computer Application study note on Networking. Read MCQ-SAQ questions answers on Networking for HS Exam 2019. Prepare Computer Application Study materials for West Bengal Higher Secondary Examination. Guided Media – Twisted Pair Cable, Co-axial Cable, Fibre Optic Cable etc. Unguided Media – Infrared Wave, Radio Wave, Microwave Wave etc. Raw Figure কে কি বলে ? কোন ওয়েব সাইটের প্রথম পেজ কে কি বলে ? IP Address কত বিটের হয়? কোন নেটওয়ার্ক Topology তে Server ব্যবহৃত হয়? ইথারনেট এর অসুবিধা কি কি? Uplink এবং Downlink কাকে বলে? One Response to "Higher Secondary Computer Application Study Notes on Networking"
Best Educational site in India.